I thought this to be a delightful photo in its own right, but then I read the story behind the house. 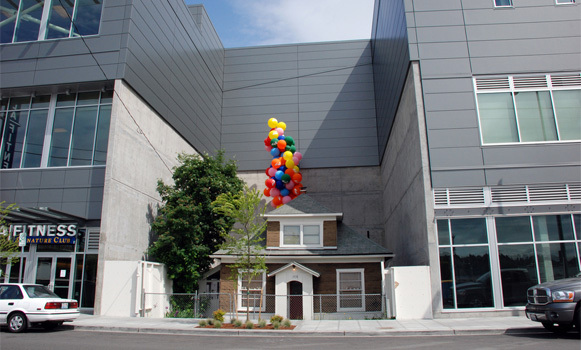 Long-time resident of Ballard, Seattle, Edith Macefield, refused to sell up as the land around her one hundred year-old property was radically developed — even when offered a million dollars. Edith sadly passed away last year but, recently, dozens of coloured helium balloons were tied to her home to promote Pixar’s latest feature “Up”, a story of a man who refuses to give up his own home after his own wife passes away. not that I admit to ever watching Dido but… this is the house featured in her “Thank You” video.